A daypack seems to be a fairly basic piece of equipment- after all, it doesn’t require the same features as a full-size framed backpack. Unfortunately, many daypacks fall short and even some of the most popular brands don’t quite succeed in producing a truly versatile, comfortable bag. Osprey is one of the few brands that is renowned for consistently producing quality backpacks of all types, with their daypacks being some of their most popular bags. The Osprey company is all about the backpacks and bags in generally. In fact they produce everything you can think of bag-wise: casual backpacks, child carriers, hydration packs, and backpack specifically design for outdoor activities. Cyclists, hikers, serious backpackers and even alpine climbers all rely on the quality of Osprey backpacks. Although they have a few different daypacks available, their Talon 11 daypack is one of their best. If you’ve been looking for a daypack that can get your through hikes or ultralight backpacking adventures, you’re going to love this model. Dimensions for each size are 18” x 9” x 8” and 20” x 9” x 8”, respectively. Just within these two size options the average man or woman should be able to use the backpack properly. If you are a very large man or a very petite woman, you should probably visit an Osprey supplier to try on this model before purchasing online. This daypack may be lightweight and compact but it is durable enough for rigorous use. The two main fabrics used in the body construction of this pack include a 70D x 100D mini shadow nylon and 210D dobby nylon. While very scratch resistant it does have poor water repellent abilities so keep this in mind if you plan on hiking in wet weather. It would be best to take along a backpack rain cover- which Osprey also produces. 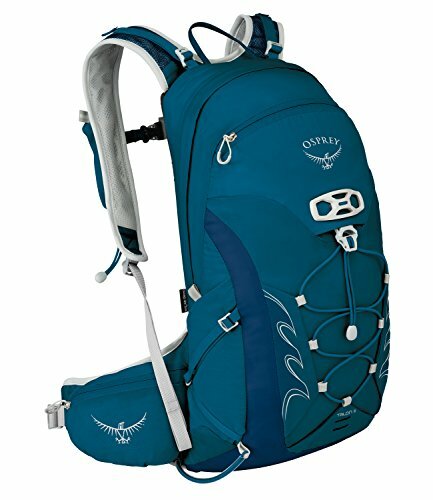 Osprey made the Talon 11 daypack to last so you can rest assured that you will get a lot of use out of this model. Additionally, Osprey always offers free repairs for any of their equipment regardless of how long you may have had it. Not many brands offer a guarantee that amazing so if you are someone that really puts their gear through a lot, that’s a huge advantage. Comfort is always an important consideration for a daypack. After all, the simplest daypack is going to give you a far better experience if it is comfortable than a high-tech backpack with all the latest features. Thankfully the Talon 11 provides features with comfort. As mentioned earlier there are two sizes available for the Talon 11. Although having only two sizes seems to limit the use of the backpack to fairly average body types, the overall adjustability of the torso and hip belt means the bag will fit a range of people. The hipbelt is wide enough that is won’t restrict torso movement in smaller people but it sturdy enough to feel comfortable on larger people, particularly those who may have a more prominent stomach. Osprey designed the Talon 11 to be gender neutral but it still fits both men and women equally well thanks again to its adjustability and use of flexible materials. Breathability is a very important factor- a clammy, sweaty back is not only extremely uncomfortable but can lead to chafing. 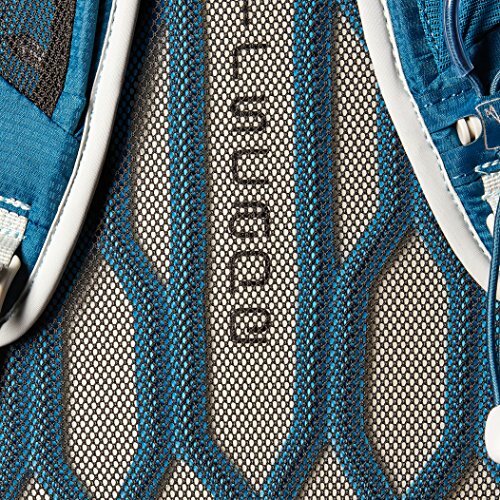 The back panel of the Talon 11 is Ospreys AirScape which helps wick away sweat and allow airflow against the back. Shoulder straps are also lined with mesh. The hipbelt is made from a combination of slotted foam and mesh so your torso will stay cool. This daypack isn’t overloaded with pockets like some of the serious, full-size backpacks but the locations of the pockets it does have allows easy accessibility. As the name would suggest, daypacks aren’t usually used overnight but rather on day-long hiking trips. Having pockets located in the hipbelt, on the side of the bag and on the top make it easy for the wearer to reach their cellphone, GPS, maps, camera, snacks, flashlight, etc. The side pockets are flexible but very strong. You can use these for water bottles as they’ll be in easy reach plus you won’t have to worry about bottles falling out if you lean over. Overall the Talon 11 is very comfortable for majority of men and women- possibly larger youth as well. 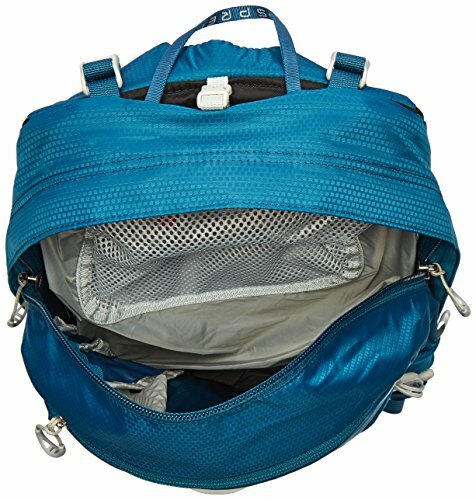 Keep in mind that this is a frameless daypack so you must keep your load light. Packing too much weight can cause discomfort and stress as this backpack is not designed for this purpose. Osprey sells the Talon 11 for “Day Hiking / Mountain Biking / Trail Running”. When it comes to versatility this bag can function in pretty much any outdoor sport or hobby as long as a daypack will suffice for the gear you need to carry. However, since there is a hipbelt those that require a lot of torso movement may be better off with a different model. Cyclists, snowboarders, skiers, and other outdoor sports enthusiasts would fall into this category. 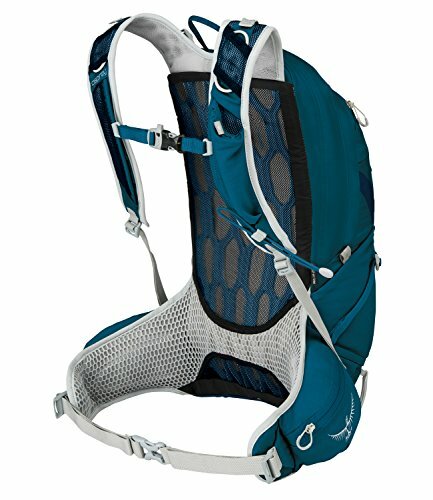 As mentioned in the Comfort section, the Talon 11 is frame less like majority of daypacks. It is important to use common sense and allow pack lightweight gear, with only the absolute necessities included. The various attachment options, like the helmet strapping and ice tool loops, really show that Osprey kept many outdoor activities in mind when creating this daypack. Active outdoorsman of all types that need a sturdy, functional daypack that they can use in numerous situations will find that the Osprey Talon 11 will quickly become their go-to backpack. Even avid travelers/backpack travelers will find that this backpack is compact enough to take with them on trains or planes while providing superior support than casual backpacks. In two sizes and 4 colors you are sure to find the right one for your size and personal taste in gear.